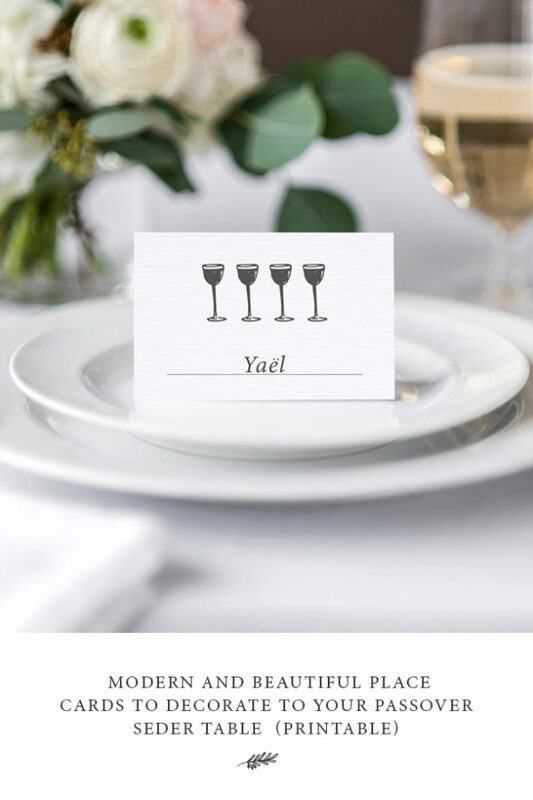 The decorative element on these Passover name cards is a custom illustration of 4 cups of wine. During the Passover seder we drink 4 cups of wine or grape juice to symbolize the redemption of the Israelites from slavery. These Passover name cards are available for immediate download and come in a high quality (300 dpi) PDF file for ease of printing. When you download the file you will receive one PDF that contains 8 Passover name cards. You can either print out the file and write your guests name by hand or you can use your computer and type your guests name in your favorite font and then print. Here is an example of the name cards with the name Yaël. Here is an example of the name card with the name David. This Passover name cards are simple to make. You can complete these Passover name cards and/or also enlist your family to help you write or type the name of your guests. Your turn: Tell us what you think of these Passover name cards! Feedback welcome. Previous What’s In Your Pantry, Amy Zitelman Hersch?